10b. “Ultra-Dispersed Nanocarbon and Method for Preparing the Same”, Kataoka, F.; Ōsawa, E.; Fujino, T.; Takahashi, M.; Idehara, O.; Terajima, A.; Inoue, Y.; Yokota, S.; Kawasaki, K. US Patent Application No. 10/847,453. May 17, 2004. Priority Claimed by JapanesePatent Appl. No. 2003-141618 (May 20, 2003). Disclosed on Jan. 31, 2005 as Publication No. US-2005-0008560-A1. 10a. “Ultra-Dispergierter Nano-Kohlenstoff und Verfahren zur seiner Herstellung”, Kataoka, F.; Ōsawa, E.; Fujino, T.; Takahashi, M.; Idehara, O.; Terajima, A.; Inoue, Y.; Yokota, S.; Kawasaki, K. German Patent Application No. DE 102004025048.0, May 17, 2004, Priority Claimed by JapanesePatent Appl. No. 2003-141618 (May 20, 2003). 7b. “Method for Preparing Nano-Sized Particulate Graphite”, Ōsawa, E. Application No. US 09/926626 (November 27, 2001), Patent No. US 6,692,718 B1 (February 17, 2004). 7a. “Method for Preparing Nano-Size Particulate Graphite”, Applicant: Ōsawa E. EP 1,205,437A1, PCT/JP00/03391, WO 00/73206, Priority: 27.05.1999 JP 14762699. By train : The nearest train station is JR Ueda, 1.5 hour from JR Tokyo by Nagano Shinkansen. From JR Ueda station, 20 min by walk or 7 min by taxi. 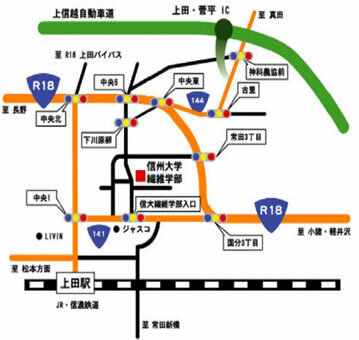 By car : The nearest Interchange is Ueda-Sugadaira of Joshin-etsu-Highway. Proceed to south on National Road #144. After passing the National Road #18 at the crossing ‘Chuo East’, turn to the left at the crossing ‘Shimokawarayanagi’ and follow a narrow but straight passage for about 1 km. The main gate of Shinshu University will be found on your left. April 2001 : R&D work on detonation nanodiamond started in a laboratory housed in the Products Development Centre of Futaba Corporation, Mobara, Chiba. October 2002 : First recognition of agglutination among primary particles of detonation nanodiamond. July 2002 : Breakthrough made in the disintegration of core agglutinates of detonation nano diamond into its primary particles. September 2004 : Moved to Toudai Kashiwa Venture Plaza, Kashiwa, Chiba. 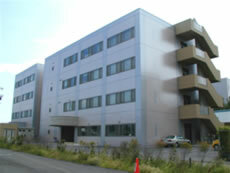 January 2007 : Moved to AREC, Shinshu University, Tokita, Ueda, Nagano. We are a nano-sized R&D company, hence has the smallest possible organization. However, we have powerful connections with academic and governmental research organizations all over the world. Discovery of C60 in 1985 triggered a world-wide surge of research activities towards fullerenes and nanocarbons, which culminated into the 2001 Clinton Speech before the US Congress in which nanotechnology was declared as one of the major technological goals of the 21st century. The brave proposition reflect inevitable trend of chemistry and materials science to approach towards each other, hence may appear a very reasonable step in the historical evolution of technology. Traditionally, chemistry has been dealing with invisible molecules while materials science with visible particles, but now we are going to develop a technology on invisibly small materials. The merge imposed considerable strain on the researchers of both sides. Chemists were perplexed at the insoluble, non-volatile, non-melting, and non-subliminal gigantic molecules having extremely large surfaces of the orders of a few hundred m2/g. It is painful for chemists to handle molecules that cannot be purified to 100% purity. Material scientists had to cope with particles, the size of which they have never handled before. It is clear that nanotechnology needs extensive supports from scientific research on the fundamental aspects of nanoparticles, which is the mission of our ‘venture’ company. Nanoscience should be best practiced in the course of developing appropriate type of nanoparticle capable of industrial applications. From the very beginning we chose to concentrate on nanocarbons, because of our long commitments in fullerenes since the discovery of C60. However, it soon became evident that typical fullerenes like C60 and carbon nanotubes are not necessarily the best targets of business, not only due to their peculiar sizes and shapes, but also because of the patent rights already secured by major enterprises. We had to retreat from the fullerene front for the time being. In reality, the business of these two highly esteemed fullerenic carbons is being much delayed, hence our choice was right. Our own analysis revealed that commercialization of nanocarbons needs to fulfill four pre-requisites. In addition to the well-known, almost mandatory condition of low cost, biocompatibility is equally important. Two more conditions are the high crystalline order in the atomistic structure and the predictable existence of large market. The importance of crystalline order is best illustrated by carbon blacks or industrial soot, which possess an ideally low cost and structural uniformity, and have been used for more than a century on large scale but never grew out of the subsidiary status of an additive to rubbers, because of extremely low structural order. In contrast, both C60 and carbon nanotubes have remarkably high atomistic order in structure but, being so new in basic structure, it is difficult to find new markets. (1)Production cost. DUNCD is isolated from soot produced by exploding a popular military explosive Composition B (TNT+RDX) in water or other inert media. Note that the expired military explosives have negative price. (2)Biocompatibility. Careful studies on the cytotoxity confirmed total absence of toxity in DUNCD (see Publication Section for references). (3)Ordered atomic structure. The primary particle of DUNCD is a single cubic diamond crystal containing about 5000 carbon atoms. With such a large number of constituent atoms, in contrast to diamondoids and adamantanoids, we can duly expect that DUNCD retains most of the properties known to bulk diamond (Table 1, link). Due to the closest packing, diamond has long been rated as the best general-purpose industrial material known on earth, especially excelling in hardness, Young’s modulus, transparency, chemical inertness, thermal conducticity and doping possibilities. (4)Marketability. What is the reason for the artificial diamonds never having been used widely as a versatile industrial material? This question is especially pertinent to the HTHP microdiamonds which have appeared in the market half a century ago and its production technology has matured well. The answer is quite simple: diamond was too hard to manipulate, thus remained impossible to process or mould. As a consequence, this potentially useful material has so far been confined to only a relatively small market of polishing material. Likewise, detonation nanodiamond was discovered 40 years ago and commercialized for 15 years but performed even worse than microdiamond; it never acquired a status of commodity. In this case, the product on market was actually tight agglutinates having 100-200 nm in diameter with its performance dominated by its amorphous inter-grain boundaries. In contrast, the dispersed single-nano diamond particles retain most of the properties of bulk diamond, and still should be amenable to the known processing technology of nanoparticles. Individual primary particles are large enough to use as the particulate material as well. We duly expect that DUNCD will prove a highly versatile material for a variety of applications. So far the preliminary results of our own experiments attest these expectations. It is our mission to develop fundamental knowledge and techniques of nanotechnology through the production, purification and application of dispersed primary crystallite particles of single-nano diamond. Registered at the Hall of Chosei village, Chosei-gun, Chiba, on April 26, 2001. Presently registration transferred to Ueda, Nagano.